"Someday you'll climb to the tops of the trees." "Someday you'll swim off to faraway seas." In rhyming couplets, this companion book to the bestselling I LOVE YOU AS MUCH tells of enduring devotion from a father to a child. A tender lullabye that is sure to become a favorite at your house. My love will be with you wherever you go. 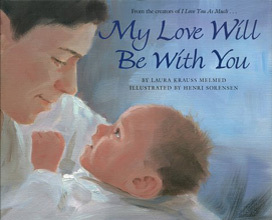 "A companion to this author-illustrator team’s previous effort, I Love You as Much..., which focused on motherly love, this cuddly picture book instead celebrates the relationship between fathers and their children. Each spread features stirring images of a papa and baby animal pair in their natural habitat, and a couplet of verse containing words of wisdom spoken by the elder, e.g., “Said the father panda to his child, ‘Someday you’ll snuggle your own cub and dream.’ ” The cozy and warm-toned oil portraits of a father lion licking his cub, awash in golden sunlight, and of a majestic eagle watching over his chick in their lofty mountain nest, are the perfect pairing for the text’s gentle rhythm and rhyme scheme. Though certain to tug especially at parents’ heartstrings, the reassuring words here will have kids clamoring to share some quiet time reading this book with someone they love."